Incorporating awareness campaigns, and engaging the community in our fundraising and service events. 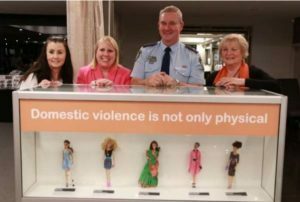 In collaboration with the project partners – Zonta Club of Sydney Hills Inc, staff and students at TAFE and the Hills Domestic Violence Prevention Committee, the project developed an imaginative and innovative installation using Barbie-type dolls and/or their photographs. This was initially displayed, for one week starting on White Ribbon Day, outside Aldi at Castle Towers Shopping Centre. (After this it was made available for use with other Zonta projects, other organizations, schools etc). This display is now available to other clubs to use dependent on conditions accompanying this document. All enquiries for hire should be directed to Bev Rooney at bev_rooney@hotmail.com or 0419211664. Or the Hire agreement. Our membership is drawn from a wide area of the Sydney Hills area, and a wide range of experience. We enjoy our monthly social gathering prior to our general meeting, plus the opportunities we have to work together in our campaigns, events and service delivery. Email your name and email address to be added to the club’s meeting and event invitation email lists. Prospective members are encouraged to attend at least two meetings/other events before submitting an application to join.